Are Grizzly Bears preparing for the Solar Eclipse? “Typically when grizzly bears emerge from their winter dens the mothers take their young to scavenge off winter killed wildlife. 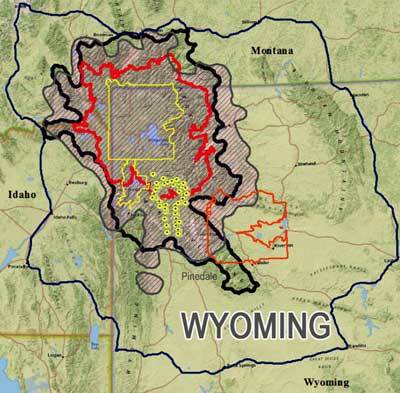 That happened this year too, but then we started to see some very unusual movement pattern in our radio collar tracking data,” said John Patterson of the Wyoming Grizzly Bear Tracking Institute. Grizzly bears hibernate in the winter as a way of getting through the cold and snow of the worst weather months. Depending on snowfall, temperature and food supply, the bears in Wyoming typically make their way to their dens in late November and emerge again in early spring, staying in their den for as many as five months. During that time they do not eat, drink, defecate or urinate, living off a layer of fat they build up during the summer and late fall months. The mother gives birth to her cubs in the winter den while she is in hibernation, often having twins or triplets. Reports of signs of grizzly bears emerging from their dens began in late March this year. This spring, wildlife scientists have been able to watch the live movement patterns of many of these bears as they emerge, thanks to being many years into a radio collaring research program. Each collared bear shows up as a moving yellow dot on their monitors and is plotted on spatial maps. With time, movement patterns start to emerge. “After about two weeks after emerging this spring, the yellow dots showing the bear movements began to align in strange linear and circular patterns,” Patterson said. “We began to see groups of yellow dots come together, then move off in certain directions, hold a pattern for awhile, and then disperse into random placement patterns again,” he said. What is odd about these patterns is that they suggest some level of cooperative ritual or foraging behavior in these grizzly bears, which has never been seen before. “Wolves will pack hunt,” Patterson said. “They will drive and run down their prey to separate the old and the weak in a herd,” he explained. “But we’ve never seen pack hunting in grizzly bears before, so we're leaning more to this being some kind of a topographical or environmentally influenced phenomenon. Mother grizzly bears will spend a lot of time in the spring teaching their young how to hunt. In the past 150 years or so since the large herds of bison disappeared the hunting pattern has been for bears to feed on winter or road kill of lone or weaker prey in isolated encounter incidents. The mother bear teaches her cubs how to hunt and where to find the best food sources, such as favored huckleberry patches in each drainage of their home range. Scientists are unsure of what the radio collar data is showing this year, Patterson said. 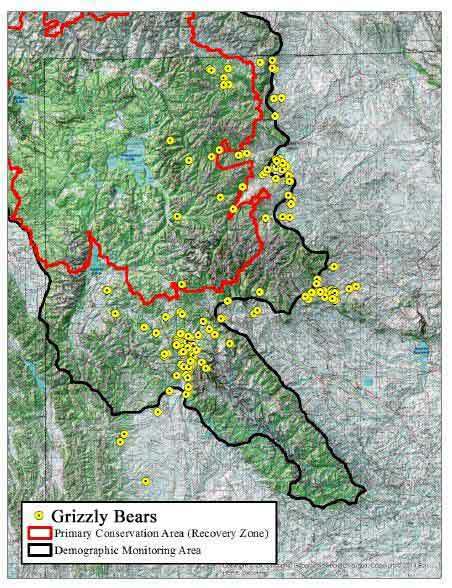 The activity appears to be only happening with bears in the Upper Green River Valley area, specifically seemingly centering on the Union Pass area of the northern Wind River Range. 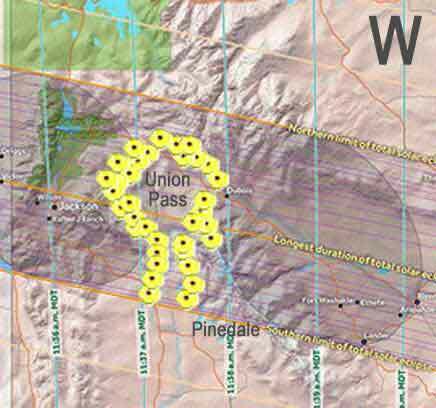 The round pattern alignments seem to encircle Union Pass at times and then disperse. Other linear alignments seem to pattern from Union Pass down along the Green River to about the edge of the forest boundary and then stop. “Sometimes we actually see two parallel linear alignments take shape along the Green River corridor as if lining up on both sides of an imaginary centerline,” Patterson said. Tracking data for bears in the southern Wind River Range this spring does not appear to show any of these kinds of alignment patterns. No one seems to have been able to come up with an explanation for the odd bear movements this spring. “There are a lot of grizzly bears up there,” Patterson said, “and just because we are seeing what appear to be gatherings and spatial alignments doesn’t mean that is what we are actually seeing. We could be completely misinterpreting these data patterns,” he said. It is anticipated things will quickly return to normal as summer progresses and more favored food sources ripen and become available. Scientists will continue to monitor the phenomenon through the summer, Patterson said. Some have suggested they are reading much more into the alignment patterns than is really there, like seeing the face of a man when looking at the moon. 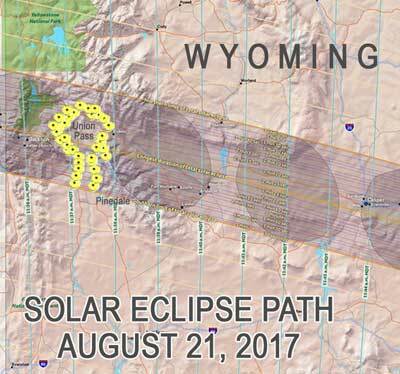 The Upper Green is expected to become a busy place this summer as visitors start to arrive into the area for the upcoming solar eclipse that will be occurring on August 21st, Tens of thousands of people are expected to pour into the area which is in the heart of "the totality" of the eclipse black-out coverage zone. Pinedale will have many fun events going on all weekend in town and special viewing stations are being set up for those going to more remote locations to get away from city lights for the best viewing experience. Leading bear expert Boris Sanders from the Grizzly Federation said it looks to him like this is group hunting behavior we haven't seen since the large herds of the buffalo. Somehow the bears might know about the upcoming eclipse too, and they are doing practice runs for the herds of visitors. 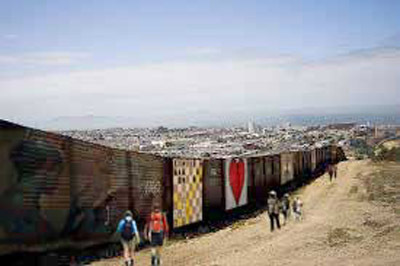 With the Trump administration announcing they will be offering opportunities for the public to lease individual panels on the U.S. side of the US-Mexico border wall, people have been getting very creative coming up with ideas for how they can use the tall and wide vertical spaces in imaginative ways. The Wyoming Tourism Department has partnered with the MEXUS Scenic Byway administration to offer 50/50 matching grants to organizations and businesses who would like to invest in a panel. 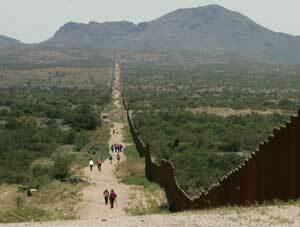 The cost for the annual lease for a space is quite reasonable, as the government is hoping to not only recover some of the cost to taxpayers of building the wall, but also to promote the 700 miles of the scenic walking path along the international border. The Pinedale Tourism Board has commissioned ten advertising panels to be located in high traffic and visibility areas along the international border wall which are expected to be seen by millions of people annually. Some people have already begun to think outside the box and explore creative ways to take advantage of very large vertical surfaces to become functional spaces beyond being barriers. 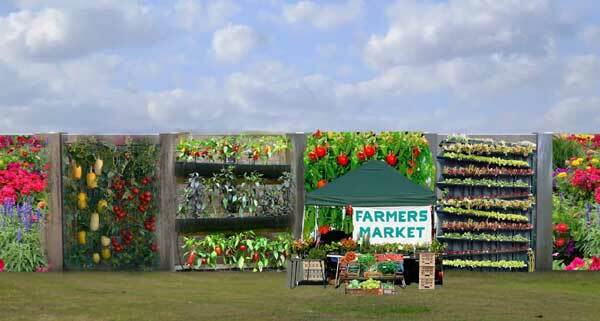 A “Reimagining the Wall’ movement has spread across the nation and even gone international with people finding imaginative ways to transform plain walls into functional surfaces such as signs, vertical gardens, and canvases where artists can express their creative talents with large format murals. Gardening enthusiasts have been signing up for a chance to use panels for the newest fad in space conserving gardening called "vertical gardening." As acreage for traditional farming and gardening is taken up by housing developments, less and less space is available for large farming operations. The concept of going up instead of out has appealed to those who live in cities and apartment dwellers who have limited space available for plants. With the concept that everyone has wall space, creative gardeners have begun to not only refine the gardening techniques but an entire cottage industry has been born based off the idea of using wall space to grow a garden. The international border wall offers not only recreational gardening space for those who live along the border, but also a potential income generating opportunity on both sides of the border for area inhabitants. Piping systems are already being installed to bring drip irrigation to remote panels at a nominal additional fee. Some exercising enthusiasts have even suggested making climbing wall routes on the US side of the international border wall since it is thought there will be little liklihood of burdening Mexico with reverse illegal immigration traffic from people recreating on the climbing wall equipment. The Pinedale Tourism Board has released a conceptual for some of the mural panels for the new advertising campaign. The focus will be to try to entice people recreating along the MEXUS scenic byway with photos of the breathtaking Sublette County scenery and western way of life, playing off the clever “That’s WY!” campaign by the State. A Tourism Board spokesperson said they have had tremendous response to the two large billboards on Interstate 80 to entice people coming from Denver and Salt Lake City to come through Pinedale on their way to Yellowstone and Grand Teton Park. Once approved, the panels will go into production and will be placed at locations along the border wall by mid-summer. Disclaimer: Pinedale OFFline is an April Fool's Day edition of Pinedale Online. All stories and persons quoted here are generally fictitious and photos shamelessly digitally altered for this special edition. No real persons or entities mentioned on this website can be held responsible for claims in Pinedale OFFline stories.